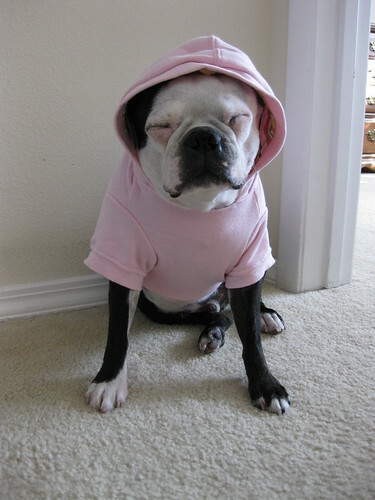 Hog was a good sport and modeled Clementine's new hoodie for me. Hog still needs to show Clementine how the modeling is done. She's not so great at it. We just got back from Florida and Clementine flew for her second time. It was Hog's 4th time. 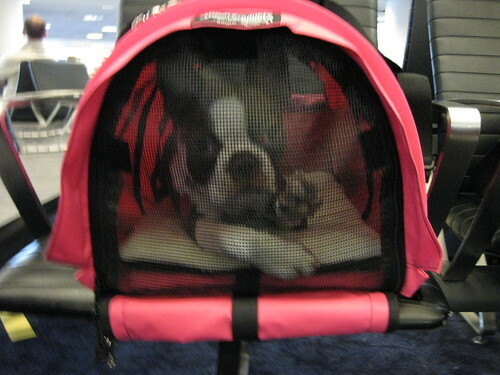 If you ever fly your bostons under your seat I highly recommend the Sturdibag. Clementine met my boyfriend's mom's cats for the first time. It was her first time seeing a cat. 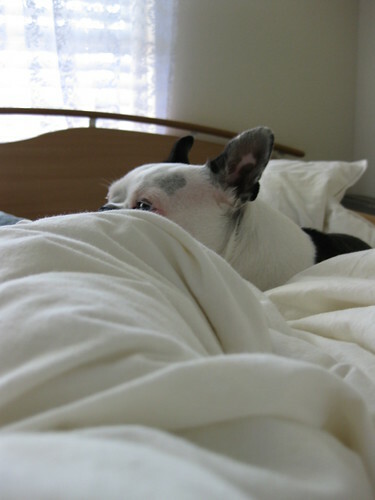 Hog for some reason is PETRIFIED of cats. You can kinda tell by the look on his face in this picture. Clemmie wasn't too sure at first but in the end she loved them. Family Photos. 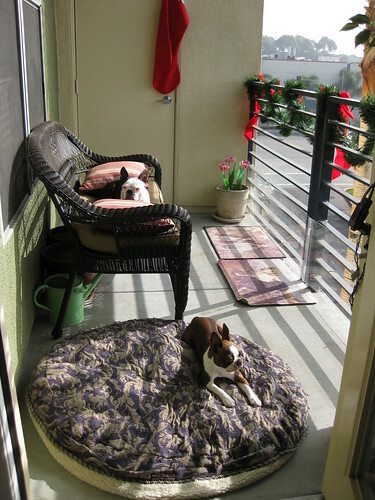 Our other two dogs aren't bostons but this our family! OH EM GEE I LOVE THAT FIRST ONE!!!!! What a beautiful family!!! Man, this is the 2nd time this week that I've wished we had Target! Seriously SO CUTE and so cheap. Stuff that would cost $30 at a botique. We don't have a walmart thank god or i would be broke. 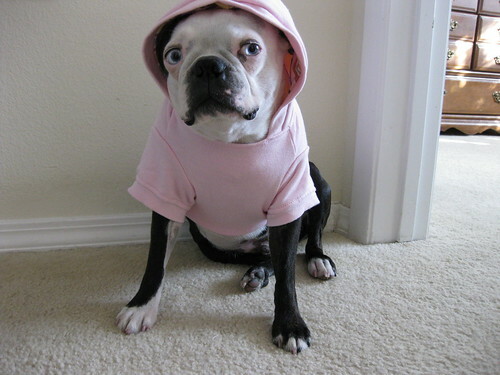 We do have walmart, but they rarely have a good selection of pet clothing. Sometimes one or two things, but we just got back from there and really, it was a sad selection. You have such an adorable family. I have a question about the sturdibag. How much does Hog weigh? 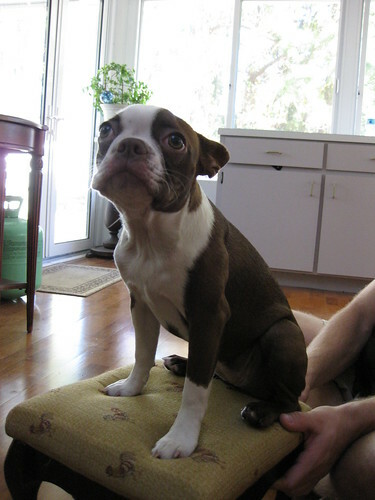 I have 2 Bostons now and they both weigh around the 25lb mark. We are moving far from home soon and we are wanting to bring the boys for visits with us and I don't want them to have to ride cargo. i really don't know how much he weighs now. The last time he got weighed was a year ago and he was 19 pounds. He may weigh like 22 or 23? 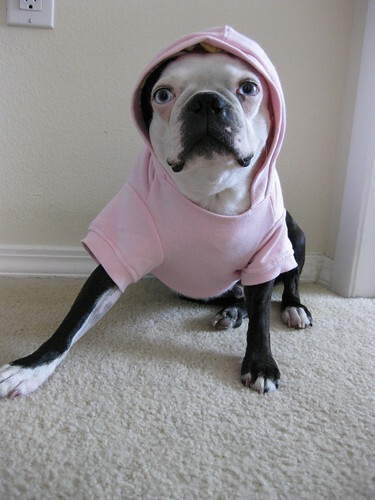 As long as your bostons can fit comfortably in a size L sturdibag you will be fine. Oh those things for the plane are really cool! I will never need to use one but they're still cool! beautiful pictures as always! 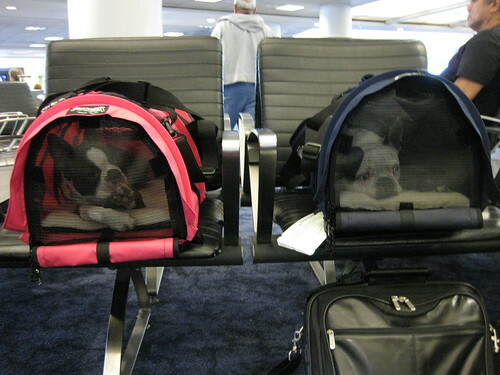 i cant imagine flying with my bostons, they'd whine the whole time. Mine didn't make a peep! Such great pics! Clemmie is getting so big! She's beautiful. 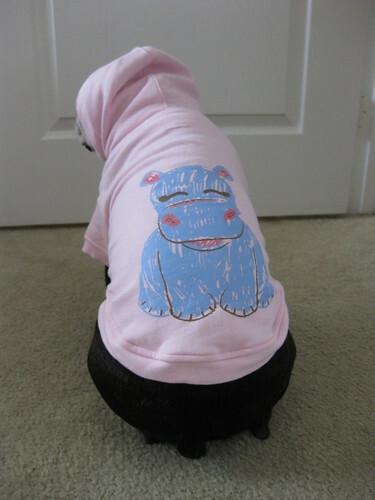 the look on his face is pic one :0) "oh man its pink, pink.. i told her i'd never wear pink... the things i do for Mom... and i did it for Mom and not Clementine"
The hippo hoddie is adorable! 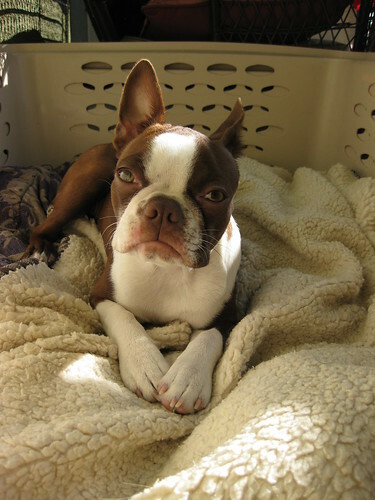 Clementine is quite a looker! Such a beautiful little girl! What a beautiful family! Clemmie is growing up to be so pretty and Hogs is such a sport!! Drama and I wish you a great holiday season.